Over the years we’ve designed (and redesigned) touch tables of all shapes, sizes, and configurations (from touch coffee tables to drafting-style touch tables) but up until now we haven’t designed a model to work like a desk. 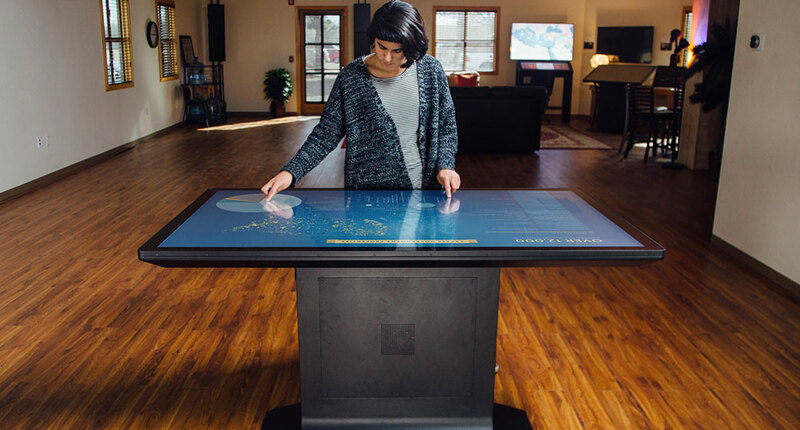 Much of our focus has been on designing touch tables for public spaces like museums, schools, labs, retail, and other demanding environments. Our new desk prototype, tentatively named the Console, has an adjustable 55″ 4K Ultra HD LG commercial display with 3M touch technology. It is built, like all of our systems, out of aircraft-grade aluminum. What is pictured below is a custom configuration for a client building an amazing futuristic command center (more on that exciting project later). 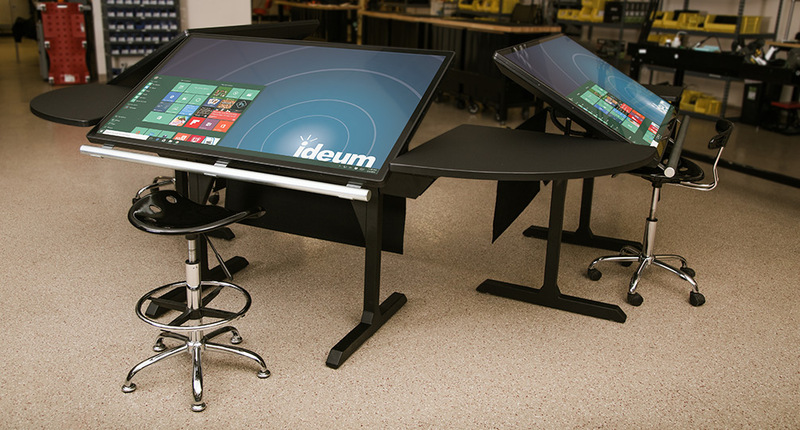 Notice we have custom shelving that attaches to the multitouch tables to create multi-unit work areas. 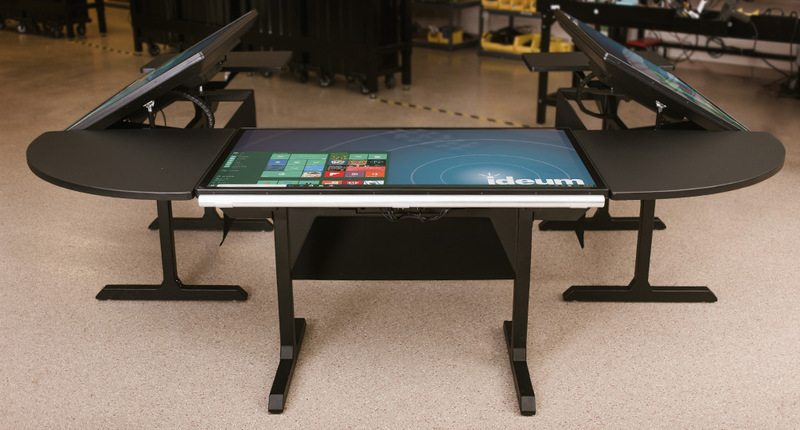 The Console touch table has a pneumatic lift system allowing it to work as a flat multitouch table or as a drafting-style table. The table’s legs route network and power cables from the display which includes a low-profile, but full-featured computer. The computer system, on the back of the display, includes a powerful Intel i7 quad-core processor, 16GB RAM, 512GB SSD hard drive, and a NVIDIA GTX 1070 graphics card. The system can be upgraded to 32GB RAM, Dual 1TB SSD, and a NVIDIA GTX 1080 graphics card. The same top quality components will go into the Console as go into our other models. Power, ethernet, audio and video plugs are accessible in the lower legs of this new model. As I mentioned, the model pictured here is part of a custom hardware project, but we are working on further developing the Console as a product within our multitouch table line with expected availability in March 2017. 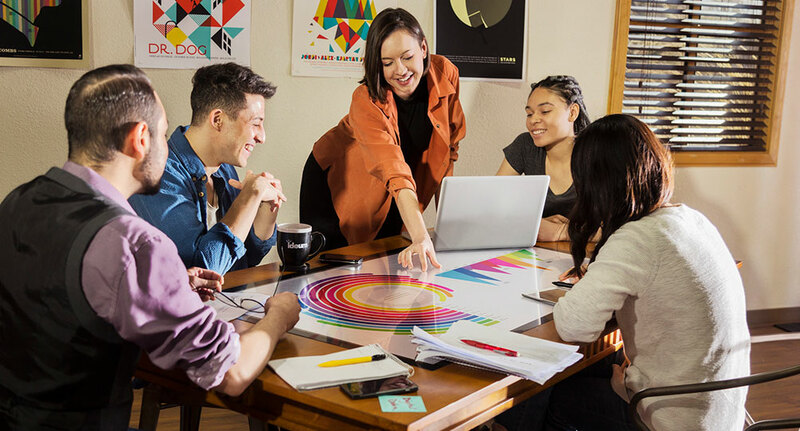 With our latest generation of displays having higher touch fidelity and improved resolution, a new generation of functional applications becomes practical. We have high hopes that the Console will meet the needs of clients looking to implement a variety of productivity, design, and communication applications in the coming years.